White House Press Secretary Sean Spicer snapped at a female reporter on Tuesday over a question about the administration's image, telling the veteran White House correspondent to "stop shaking your head" — a snide comment that drew rebuke from Hillary Clinton and several prominent women journalists. 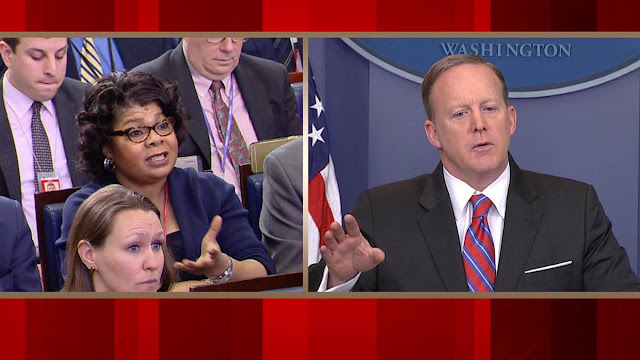 Spicer got into a heated exchange with American Urban Radio Networks' correspondent April Ryan at the White House press briefing after the reporter asked how President Donald Trump's administration would work to repair its image. Ryan followed up with a question about Trump's meeting with former Secretary of State Condoleezza Rice, whom Trump made a vulgar comment about in 2006. Spicer then accused Ryan of wanting to push an agenda, telling her from the podium to "stop shaking your head." "April, hold on, it seems like you're hell-bent on trying to make sure that whatever image you want to tell about this White House stays," he said. "I'm sorry, please stop shaking your head again," he added. Former Democratic presidential nominee Hillary Clinton and several well-known female reporters rushed to defend Ryan over what they said was unfair belittling of a journalist and a "grown woman." "April Ryan, a respected journalist with unrivaled integrity, was doing her job just this afternoon in the White House press room, and she was patronized and cut off trying to ask a question," Hillary Clinton said during a speech at a conference for the Professional Business Women of California (PBWC) on Tuesday night. Later Tuesday afternoon, Ryan defended her choice of questions on MSNBC and said she felt she was treated like "road kill." "I understand what Sean is doing — Sean is being the White House press secretary, talking about and trying to make this administration look better than what it does right now and, unfortunately, I was road kill today," Ryan said. On Wednesday, Spicer said on Hugh Hewitt's radio show that Ryan is a "tough reporter" and he treats her the same as any other member of the press. "To suggest that somehow because of her gender or race she'd be treated differently, I think, is frankly demeaning to her," Spicer said. "She's a tough woman that fights every day to get out there for her publication and her audience to get the questions that she wants answered, and I respect that." This was not Ryan's first puzzling encounter with the Trump administration. When Ryan, who is African American, asked Trump during a February press conference if he would be meeting with the Congressional Black Caucus to discuss his agenda, Trump responded, "I would. Do you want to set up a meeting? Are they friends of yours?" "No," Ryan replied. "I'm just a reporter." The tense exchange Tuesday began when Ryan asked how Trump's administration would "try to revamp its image" after two months in office. Ryan cited looming concerns regarding investigations into Russia's interference into the U.S. election, and whether there was any collusion between the Kremlin and Trump's campaign or transition team, as well as other controversies. "I've said from the day that I got here that there is no connection," Spicer said of Trump and Russia, cutting off Ryan's question. "You've got Russia!" "If the president puts Russian salad dressing on his salad tonight, somehow that's a Russian connection," he added. Spicer then first accused Ryan of having an agenda and said she needed to "report the facts." "At some point, report the facts. The facts are that every single person who has been briefed on this subject has come away with the same conclusion — Republican, Democrat — so I'm sorry that that disgusts you," he said, telling her, "You're shaking your head, I appreciate it." "At some point, April, you're going to have to take no for an answer with respect to whether or not there was collusion," he added, even though investigations into the matter are still ongoing and Rep. Adam Schiff, the ranking Democrat on the House Intelligence Committee, has said there is "more than circumstantial evidence" of collusion. The correspondent then jumped in and said she was asking about how the administration was going to change its image and the perception of the White House. Spicer said the president's team would "keep doing everything we're doing" in order to enact the platform Trump ran on during his campaign. Ryan then followed up with a question about Trump's meeting with Rice. Rice was critical of Trump during the presidential campaign, calling on him to withdraw in October. Spicer questioned why Ryan asked those two questions back-to-back and again accused her of wanting to push an agenda, telling her to "stop shaking your head" as he spoke. 0 Response to "Reporter April Ryan on Spicer confrontation: I shook my head 'in disbelief'"